Add the rest of the turmeric, cinnamon bark, ground cinnamon, cardamom and cloves and continue frying until all are brown. Slowly, add the chickpeas, sultanas, almonds and cashew nuts and fry gently. Cover and cook for 7 to 10 minutes on low heat. To make the quzi, marinate the whole lamb with salt and turmeric and leave to rest for 30 minutes. Blend the garlic with the ginger, chilli and vinegar. Season with bezar and salt and rub the mixture into the meat inside and out. Leave aside to rest for 30 minutes. Fill the lamb with the hashwa. Sprinkle saffron on top of the lamb. Put on a braising tray and braise for 3 hours. 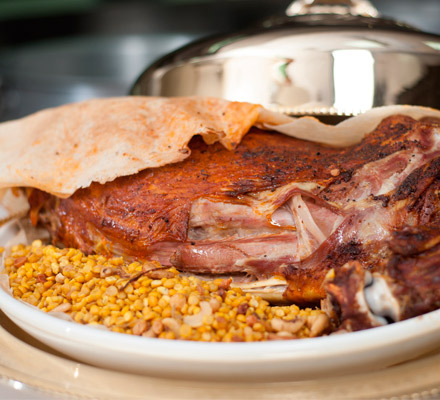 To serve, remove the lamb from the braising tray and place in a large, round ceramic dish lined with rigag bread. Cover the lamb with more rigag bread, spoon some of the natural gravy and ghee over the rigag bread until moderately soaked. Place some of the stuffing on the side and serve immediately.